With our fall fundraiser now underway, we thought we should take the time to point out some of our newest thank you gifts. We know you're all donating because you can't find regional news coverage like ours anywhere else on the dial, and you love laughing along with "Wait, Wait, Don't Tell Me!" and "Ask Me Another" on the weekends, and you'd be lost without the hourly news updates from NPR... but a cool mug doesn't hurt! This year we're introducing a new "1A" mug. It's a two-tone mug, black on the inside, white on the outside, that features both the "1A" logo and our own logo. They're available for a contribution of just $10 a month. We're also making sure you have all the news you need heading into the midterm election with a new incentive -- a year-long,digital subscription to "The New York Times." You'll have full access on the web, on your smart phone or tablet all for $15 a month. Picture yourself waking up to WRVO, enjoying "1A" with a cup of coffee, all while skimming "The New York Times." 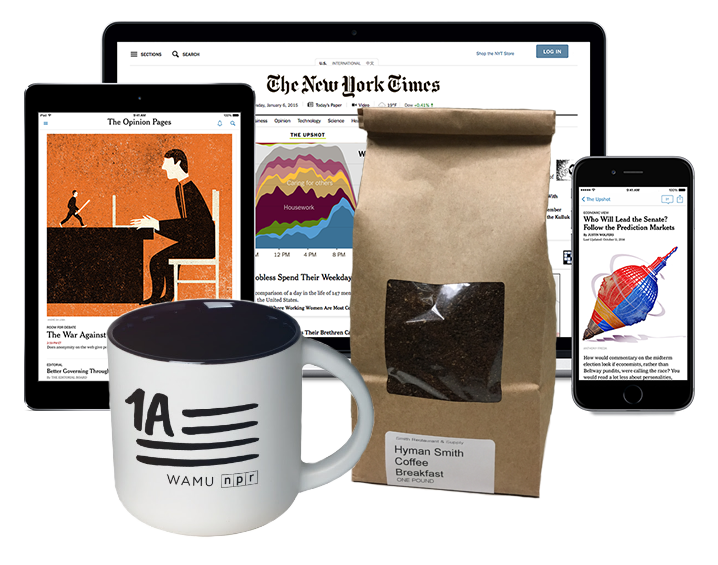 As a special thank you to those of you able to contribute a dollar a day, we've put together the morning news package, including: the "1A" mug, NYT digital subscription and a bag of Hyman Smith's breakfast blend coffee (freshly ground). If you'd like any of these special thank you gifts, just make a contribution by clicking the "Donate" button at the top of this page. We'll be packing them up and sending them your way at the end of the fundraiser. A special note to those of you who enjoy the WRVO Membercard. We're still providing it -- no worries there -- but we are doing so on an opt-in basis. When you donate, be sure to indicate that you want the Membercard. There's a new question on our donation form that ensures you'll get those dining, shopping and other discounts. If you have any questions about our fundraiser, these thank you gifts or the Membercard... give us a call at (315) 312-3690 anytime. If it's not during business hours, we'll give you a call back as soon as we can.